A massive blackout plunges much of Toronto's west end into darkness for about 90 minutes, leaving thousands without power just as the weather makes a sharp drop into sub-zero temperatures. There is no word yet about what may have caused Tuesday night's massive blackout that plunged much of Toronto's west end into darkness, leaving thousands without power just as the weather made a sharp drop into sub-zero temperatures. Most reported losing power at around 9 p.m. Tuesday. 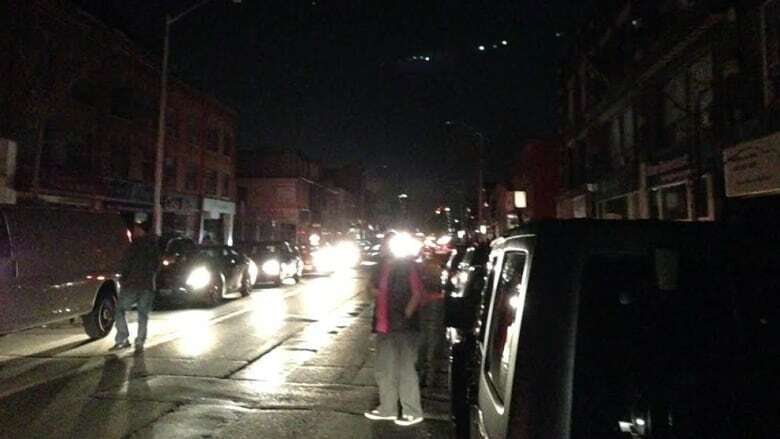 At its peak, the blackout covered an area bordered by Yonge Street, Lawrence Avenue, the Mississauga boundary, and Dupont Street according to Hydro One. Though neighbourhoods further south and east were also said to have been affected, including High Park, Bloor West Village, Liberty Village, the Beaches and the University of Toronto. Power was restored shortly before 11 p.m., according to Hydro One. Hydro One officials said late Tuesday that crews were still working on the system, but they do not know what may have caused the outage. "The cause of the outage is currently under investigation," the company said in a statement. "There were no injuries or health and safety issues reported due to the incident." Hydro One earlier said the blackout was due to a problem in its transmission system. The lights went out at around 9:30 p.m. Shortly after 10 p.m. there were reports that power was back on in some of the affected areas, though much of the west end remained dark. Subway service — which had been partly knocked out on the Bloor-Danforth line — was restored at about 11 p.m. according to the TTC. Toronto Fire Service said it freed people from as many as a dozen stalled elevators across the affected area. Four or five alarms also went off due to pressure failures in water systems and other complications, TFS said. On Twitter, the #darkto hashtag popularized during the extended blackout that followed last year's ice storm quickly filled up with status reports, quips and photos of darkened streets, subways and Passover dinners.